A Cardboard Problem: I lied. 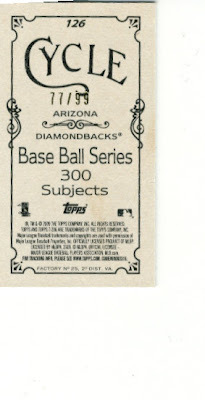 Remember someone saying they weren't really a fan of T206 and weren't going to buy any more of them? Me neither. So I ended up in Target over the weekend because I was given a gift card even though I was so bored I probably would have gone there anyway. I accidentally bought 11 packs of T206 instead of 10, and rather than put one back I figured I had better keep it in case there was something good in it. 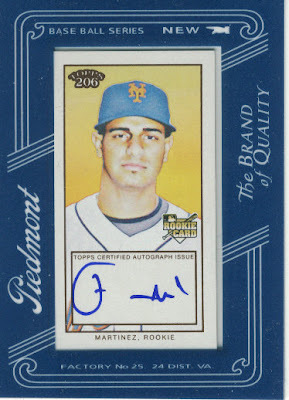 I am very impressed with the content of the retail packs as well as the inability of pack searchers being able to distinguish autos and relics, either that or they just haven't been searching packs in my Target. For those of you that follow the Mets (sorry to hear it), F-Mart is one of their better prospects despite his rocky look last season. I'm actually rather pleased with pulling an on card auto, and of someone who is supposed to be pretty good, too. That being said, I am willing to trade it. 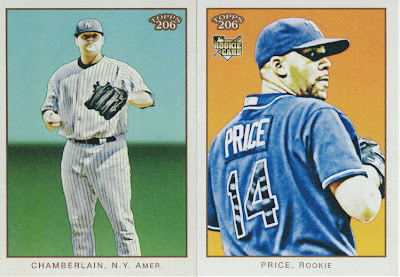 I can pretty much guarantee this won't be the last of the T206 you see around here. Anyone with a Pujols Bronze, Cycle card, Old Mill, or NNO variant please e-mail me to work something out. Also, don't forget to participate in this weeks Sunday Question. We want to gather as many of your answers as possible to post this week. Oooo cool stuff. I like this set more and more every time I see the cards. I still am kinda so so on the hits but the base cards are pretty. These retail 206 packs are growing on me too. I thought the boxes at my Target were searched, I ended up with a Chipper relic. How many cards do you get in retail pack? Do you get a bronze card in every retail pack? 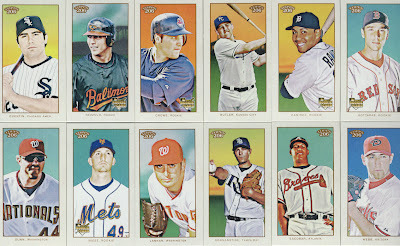 It might be worth it to buy blasters instead of hobby, especially when hobby packs cost $5 each. You get 6 cards in retail packs, 9 in hobby. I would rather buy a blaster but no stores around here have them yet. 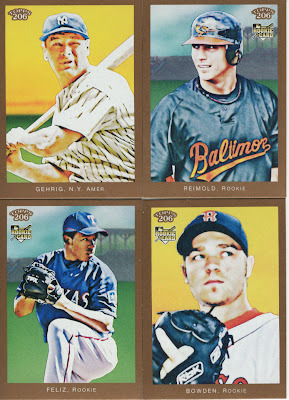 Target had Topps Heritage High Series, but no T206 yet. Nice pulls, especially for retail. Nice hit. I noticed the framed autos aren't too difficult a pull in retail, something like 1:41 packs, and the all the relic groups are way over 1:100 packs. I bought two packs today while, and came away with a Cycle mini of Curtis Granderson. That was nice. yep. I bought retai of this twice already and then bought a few hobby packs today. I'll post my entire haul tomorrow ... probably. Found and bought a blaster today at Target. Out of 8 packs, I pulled 2 SPs (1:4), a Polar Bear (1:10) and an Old Mill (1:20).